Bangkok (Thailand) – January 5, 2017 (by Bernard A. Metzger) — For those who seek a transcendent experience, a selection of river cruises replete with the colonial romance of river travel but with a modern twist and bespoke itinerariesis set to be launched. 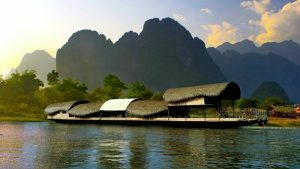 Mekong Kingdoms cruises recreates and elevates the concept of river travel with their fleet of five vessels where guests can enjoy first-class services from gourmet meals to plush cabins with unique, curated experiences both aboard and ashore along the way. Itineraries include guided jungle treks, a visit to the Pak Ou caves — with its awesome limestone karst formations, these two caves have been gifted thousands of Buddha images, left by pilgrims over the centuries. Guests can make a friend in the Hmong Village at Pak Beng or be taught traditional weaving at Ban Baw and further discover rural Laos by mountain biking in the stunning village of Ban Houy Phalam.